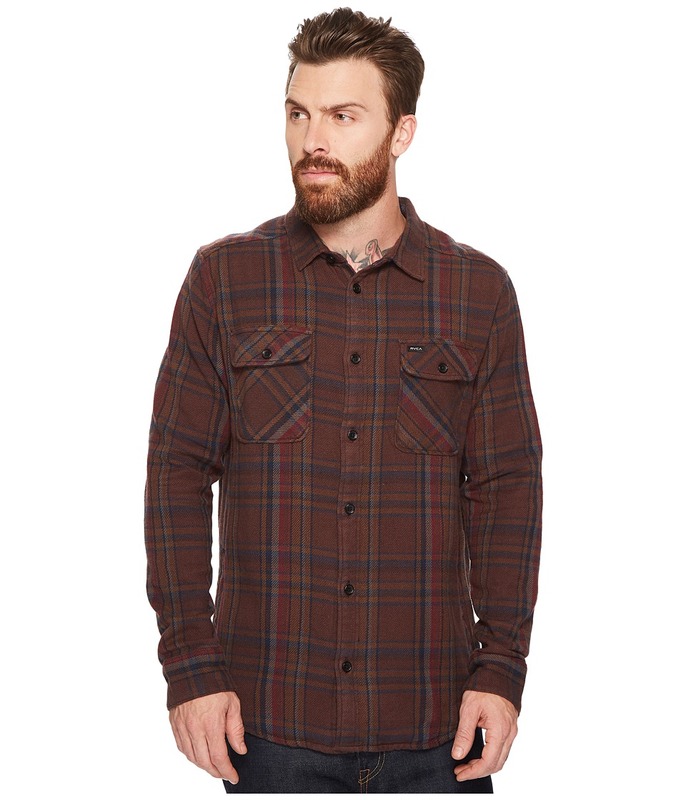 Rep classic, laid-back vibes in the Camino Flannel Shirt. Regular fit cotton-flannel shirt with a heavy-vintage wash and allover-plaid print. Spread collar. Button-up front closure. Long sleeves with single-button cuffs. Dual-chest pockets with button flaps. Shirttail hem. 100 percent cotton. Machine wash, tumble dry. Imported. Measurements: Length: 29 1 2 in Product measurements were taken using size MD. Please note that measurements may vary by size. Keep it classique . Slim fit tee features brand embroidery and cut-and-sew striping. Crew neck. Short sleeves. Straight hem. 100 percent cotton. Machine wash, tumble dry. Imported. Measurements: Length: 29 in Product measurements were taken using size MD. Please note that measurements may vary by size. Clean, classic, always on point. RVCA Red Stitch featured at shoulders, paired with a custom fit and forward-thinking design from the Artist Network Program. Soft heathered cotton-poly blend features a glitched-out brand graphic emblazoned at back. Rib-knit crew neck. Short sleeves. Brand logo at left side. Straight hem. 55 percent cotton, 45 percent polyester. Machine wash, tumble dry. Imported. Measurements: Length: 28 in Product measurements were taken using size MD. Please note that measurements may vary by size. 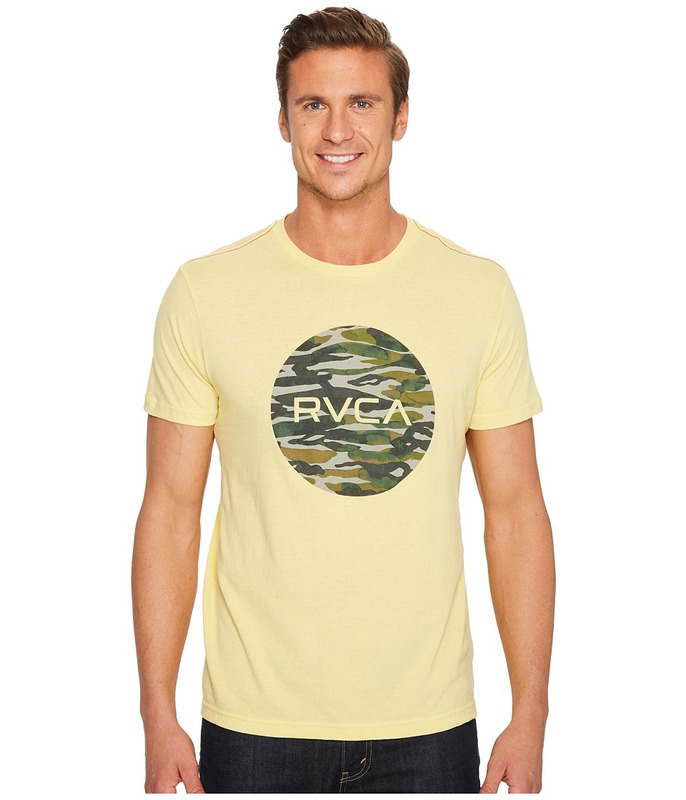 Rev up your swagger in the Water Camo Motors Tee. RVCA Red Stitch featured at shoulders, paired with a custom fit and forward-thinking design from the Artist Network Program. Soft cotton fabrication features a camo-inspired brand graphic printed at chest. Rib-knit crew neck. Short sleeves. Straight hem. 100 percent cotton. Machine wash, tumble dry. Imported. Measurements: Length: 28 in Product measurements were taken using size MD. Please note that measurements may vary by size. 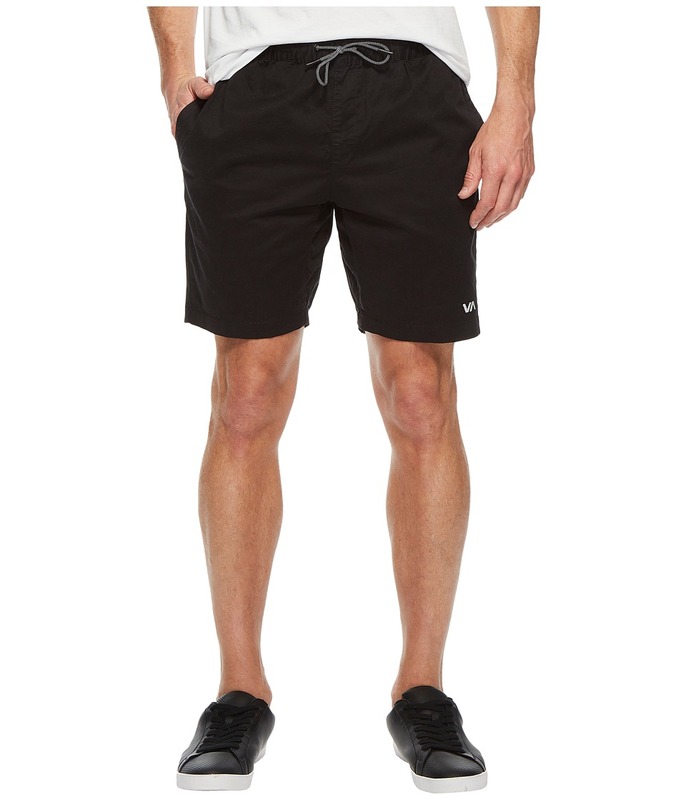 Chill out in this RVCA short. Durable cotton fabrication keeps you going all day long. Elastic waistband with drawstring closure. Slanted hand pockets. Zippered back pocket for even more storage. RVCA label at left cuff. 97 percent cotton, 3 percent elastane. Machine wash cold, tumble dry low. Imported. Measurements: Waist Measurement: 32 in Outseam: 18 in Inseam: 8 in Front Rise: 10 in Back Rise: 17 in Leg Opening: 18 in Product measurements were taken using size MD, inseam 8. Please note that measurements may vary by size. Layer up. Lightweight, breathable cotton-jersey features contrast, layered detail. Elastic waistband with drawstring tie. Side hand pockets. 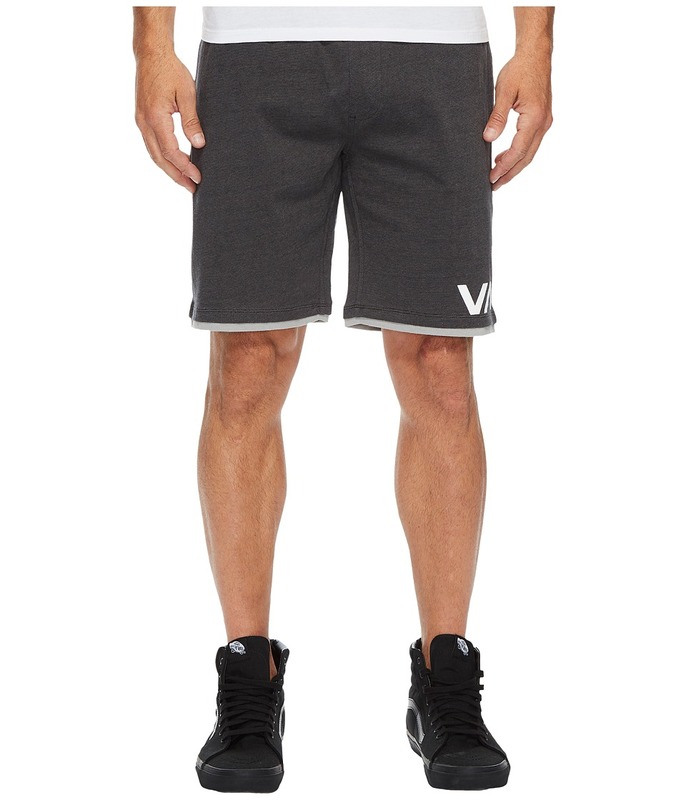 VA logo at left leg. 100 percent cotton. Machine wash, tumble dry. Imported. Measurements: Waist Measurement: 32 in Outseam: 19 in Inseam: 9 in Front Rise: 11 in Back Rise: 14 1 2 in Leg Opening: 21 in Product measurements were taken using size MD, inseam 9. Please note that measurements may vary by size. 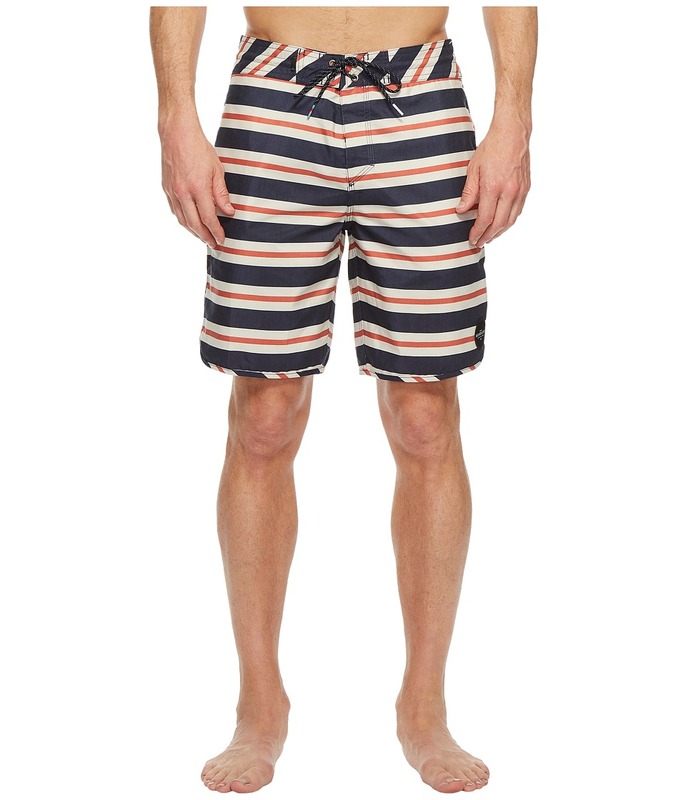 Find your own slice of paradise in these performance RVCA trunks. Four-way stretch fabric enhances comfort and allows a wider range of movement. DWR (durable water repellent) finish sheds moisture. Tropical palm print with contrast pocket. Fitted waist with surf-tie front. Functional hook-and-loop fly. Slash hand pockets with hook-and-loop back pocket. 94 percent polyester, 6 percent elastane. Machine wash, tumble dry. Imported. Measurements: Waist Measurement: 32 in Outseam: 19 in Inseam: 9 in Front Rise: 11 in Back Rise: 15 in Leg Opening: 20 in Product measurements were taken using size 32. Please note that measurements may vary by size. If you~re not fully satisfied with your purchase, you are welcome to return any unworn and unwashed items with tags intact and original packaging included. Rep laid-back vibes in the cute, chic Randy Romper. Loose-fit romper crafted from a lightweight jersey blend. Scoop neckline. Sleeveless-tank design. Wide shoulder straps crisscross in back. Back-zip closure. 100 percent rayon. Machine wash, line dry. Imported. Measurements: Inseam: 2 1 2 in Shoulder to Crotch: 31 in Shoulder to Toe: 29 1 2 in Product measurements were taken using size SM. Please note that measurements may vary by size. Don~t be left stranded on a gorgeous, tropical island without the equally-matched beauty of the RVCA Deserted Swim Bottom. Low-rise bikini swim bottoms crafted from a lightweight, comfortable poly-stretch blend. Allover-floral design. Stretch waistband. Center-back seam and a clean-finish throughout. Cheeky rear coverage. 80 percent polyamide, 20 percent elastane. Hand wash, dry in shade. Imported. If you~re not fully satisfied with your purchase, you are welcome to return any unworn and unwashed items with tags intact and original packaging included. Rep timeless style in the gorgeous Tempted Dress. Lightweight stretch fabric lends a relaxed silhouette for all-day comfort and unhindered mobility. Round neckline. Sleeveless construction. Open V-shaped back with crisscross straps. Side hand pockets. Straight hemline. 97 percent viscose, 3 percent elastane. Machine wash, tumble dry. Imported. Measurements: Length: 33 in Product measurements were taken using size SM. Please note that measurements may vary by size. Don~t be left stranded on a gorgeous, tropical island without the equally-matched beauty of the RVCA Deserted Bralette. Pull-on swim top crafted from a lightweight, comfortable poly-stretch blend. Allover-floral design. Plunging neckline with crisscross-strap and cutout detail. Removable soft cups for a customized fit. Adjustable shoulder straps. Back-hook closure. 80 percent polyamide, 20 percent elastane. Hand wash, dry in shade. Imported. If you~re not fully satisfied with your purchase, you are welcome to return any unworn and unwashed items with tags intact and original packaging included. Drift off into the weekend with classic, laid-back style. 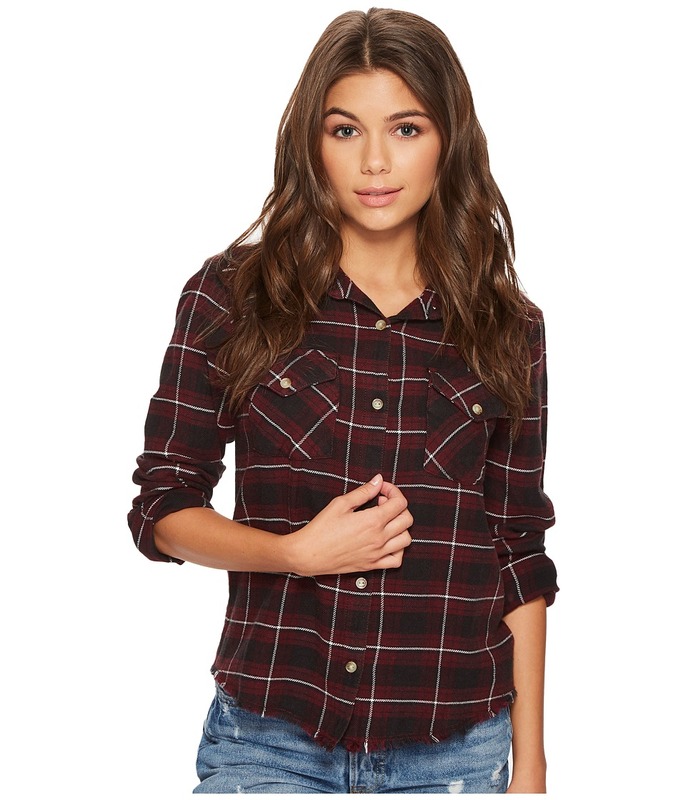 Lightweight flannel shirt features an allover-plaid design. Spread collar. Full-length button closure. Long sleeves with single-button cuffs. Dual-chest pockets. Raw-shirttail hemline. 100 percent cotton. Machine wash, tumble dry. Imported. Measurements: Length: 23 in Product measurements were taken using size SM. Please note that measurements may vary by size. Keep on keepin~ on in the casual Run On Tee. Lightweight poly-knit top lends a relaxed silhouette for all-day comfort. Rib-knit neck band with V-neck cutout. Short sleeves. Straight hemline. 65 percent polyester, 35 percent viscose. Machine wash, tumble dry. Imported. Measurements: Length: 24 in Product measurements were taken using size SM. Please note that measurements may vary by size. Mix up your sweater-weather swagger. 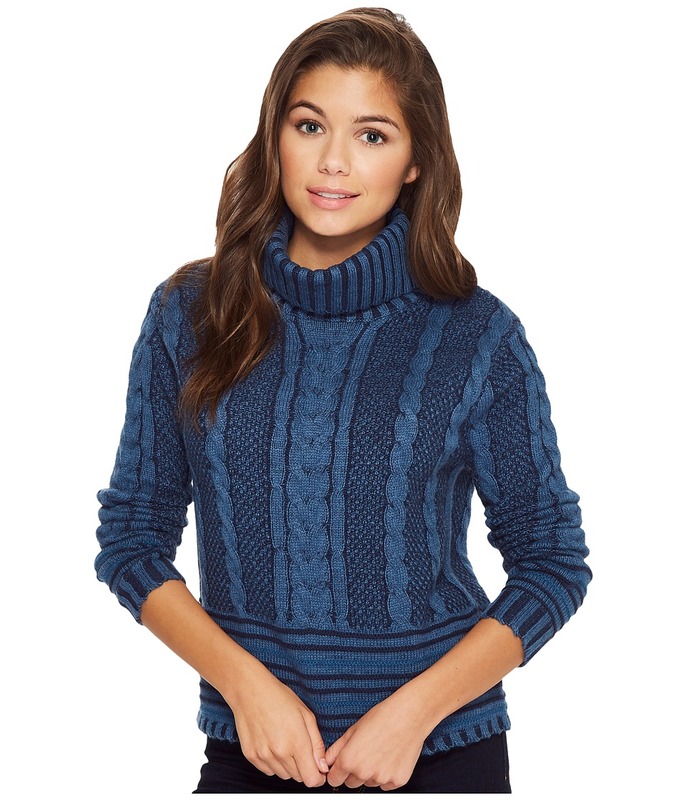 Pullover sweater in a mixed-knit cotton blend. Cowl neckline. Long sleeves. Straight hemline. 55 percent cotton, 30 percent acrylic, 15 percent nylon. Hand wash, dry flat. Imported. Measurements: Length: 21 1 2 in Product measurements were taken using size SM. Please note that measurements may vary by size. Let the only shade cast be, done so by palm trees. Reversible bikini bottom flaunts an all-over floral print or a sleek and solid colorway. Lightweight-stretch blend enhances comfort and allows a natural range of motion. Elastic waistband. Caged sides. Cheeky rear coverage. Main: 80 percent polyamide, 20 percent elastane Lining: 80 percent polyamide, 20 percent elastane. Machine wash, hang dry. Imported. If you~re not fully satisfied with your purchase, you are welcome to return any unworn and unwashed items with tags intact and original packaging included. Let the only shade cast be done so by palm trees in the gorgeous Palmer Triangle Swim Top. Reversible bikini top flaunts an all-over floral print or a sleek and solid colorway. Lightweight-stretch blend enhances comfort and allows a natural range of motion. Plunging neckline. Adjustable shoulder straps lend a cute, caged racerback design. Main: 80 percent polyamide, 20 percent elastane Lining: 80 percent polyamide, 20 percent elastane. Machine wash, hang dry. Imported. If you~re not fully satisfied with your purchase, you are welcome to return any unworn and unwashed items with tags intact and original packaging included. Scope out your spot in the sand and post up with effortless style. One-piece swimsuit crafted from a lightweight stretch blend for enhanced comfort and a natural range of motion. Removable soft cups provide customized shape and support. Adjustable shoulder straps. High-waist with cheeky-rear coverage. Back-hook closure. Main: 80 percent polyamide, 20 percent elastane Lining: 80 percent polyamide, 20 percent elastane. Hand wash, hang dry. Imported. If you~re not fully satisfied with your purchase, you are welcome to return any unworn and unwashed items with tags intact and original packaging included. The haters will quiet down in absolute awe when you throw on the standout Zip It Dress. 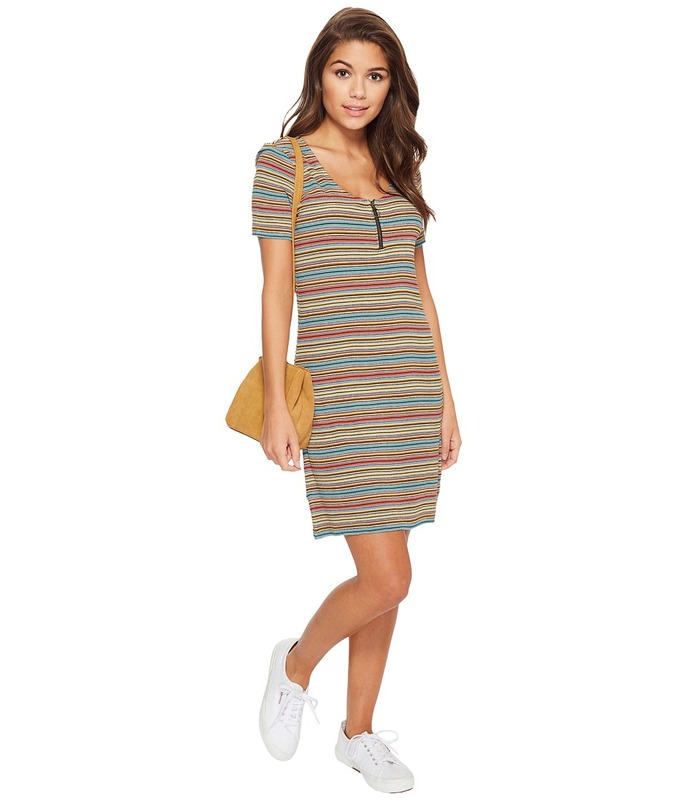 Yarn-dyed rib-knit dress lends a flattering, fitted silhouette. Scoop neckline with zip placket. Short sleeves. Slip-on design. Straight hemline. 91 percent viscose, 9 percent elastane. Machine wash, tumble dry. Imported. Measurements: Length: 35 in Product measurements were taken using size SM. Please note that measurements may vary by size.